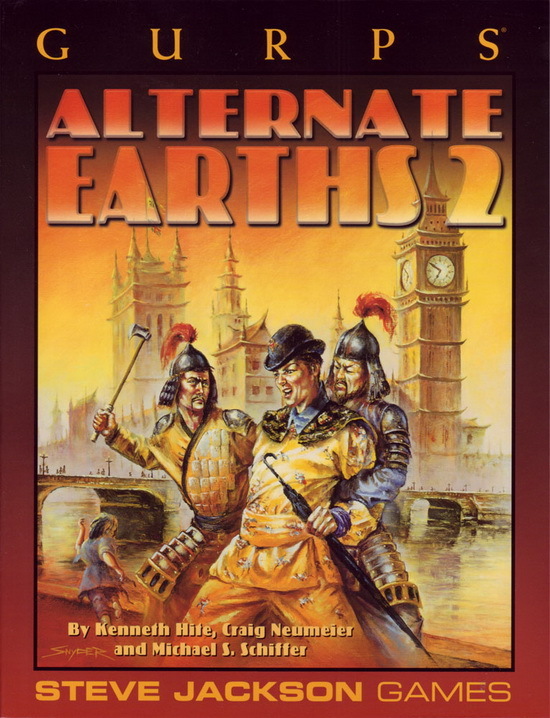 As we said in GURPS Alternate Earths, there is no finer bibliography of alternate histories than Uchronia, Robert Schmunk's definitive reference. 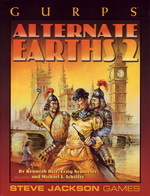 See the bibliography in GURPS Alternate Earths, for other inspirational reading, both in this category and the next. Anderson, Poul, The Shield of Time (Tor Books, 1990). A fixup of three Time Patrol stories, the last one featuring two alternate timelines. Crowley, John, Great Work of Time (1991). British conspiracy manipulates the time stream with the very best intentions. Dozois, Gardner and Stanley Schmidt, eds. Roads Not Taken (Del Rey, 1998). A recent collection of stories from Analog and Asimov's. Ferguson, Niall, ed. Virtual History (Trans-Atlantic, 1998). Mostly overwritten and underthought, but the highest-profile "mainstream" nonfiction AH in decades. Garfinkle, Richard, Celestial Matters (Tor, 1996). A very alternate history in which Classical Greek theories of astronomy, physics and politics are all literally true. Sterling, Bruce, "Mozart in Mirrorshades." A classic of callous crosstime exploitation, complete with freedom-fighting Masons. Diamond, Jared, Guns, Germs, and Steel (Norton, 1997). A well-written environmental grand history of humanity which suffers only from the flaw of fighting a war won decades ago. Johnson, Paul, The Birth of the Modern (Harper-Collins, 1986). Responses to Johnson vary from worship to contempt; we find him useful and vastly readable. Try this book first, and if your blood pressure can stand it, move on to Modern Times or A History of the American People. Landes, Daniel, The Wealth and Poverty of Nations (Norton, 1998). An acerbic, opinionated economic history of the last half-millennium or so, focusing on impolitic questions and giving equally abrasive answers. McEvedy, Colin, The New Penguin Historical Atlas of Ancient History (Penguin, 1967). This volume and its successors in the same format combine accessibility with accuracy and tons of clear, useful maps. Smil, Vaclav, Energy in World History (Westview, 1994). To the author, "energy" covers agricultural efficiency as well as industry, making this a good reference work for the history of basic technology. Trager, James, The People's Chronology (Holt, Rinehart and Winston, 1979). Still probably the best of the chronology format books on the market, covering a broad range of topics. Anderson, Poul, "The Man Who Came Early." The other side of the coin, set in Viking Iceland for Midgard fans. de Camp, L. Sprague, Lest Darkness Fall (Tor Books, 1996). First published in 1939, the paradigmatic SF classic: modern scholar prevents the Dark Ages. de Camp, L. Sprague, "The Wheels of If." In de Camp's other classic, the hero's advantage isn't knowledge of technology – about the same in this alternate history – but of machine politics. Flint, Eric, 1632 (Baen, 2000). The first of many books which chronicle the disruptive effects of a modern coal-mining town's appearance in Germany during the Thirty Years' War. 1632.org is the definitive reference site, and includes a recommended reading order. Frankowski, Leo, "Conrad Stargard" series. Six novels (four plus two sequels) with the most details of advancing technology, but marred by excessive outtime help and the author's extraordinary sexism. Piper, H. Beam, Lord Kalvan of Otherwhen (Ace, 1984). Definitive secret-of-gunpowder alternate history, set in Aryan North America. Stirling, S.M., Island in the Sea of Time (Roc, 1998), Against the Tide of Years (Roc, 1999), and On the Oceans of Eternity (Roc, 2000). The largest-scale example, a trilogy which sends an entire modern community back to the Bronze Age. See also Dies the Fire (Roc, 2005) and its sequels, which explore the impact of that event on the modern world. Burke, Edmund, Reflections on the Revolution in France. A prophetic contemporary attack on the revolutionaries from a liberal perspective. Laidlaw, Marc, "His Powder'd Wig, His Crown of Thornes" Possibly the best "Brits-win" AH story in existence. Powerful indictment of colonialism. Piper, H. Beam, "He Walked Around The Horses" and "Crossroads of Destiny." Piper is always good, and any excuse to recommend him is a good one. These two stories take place in different timelines with failed Revolutions. Sobel, Robert, For Want of a Nail (Greenhill/Stackpole, 1997). A straight-faced history of North America after the failed Revolution, complete with fictional footnotes. He's much nicer about the British than we are, but his book is too good to omit. de Camp, L. Sprague, "Round-Eyed Barbarians." Workmanlike story of Chinese-conquistador conflict in North America. Huang, Ray, 1587: A Year of No Significance (Yale University Press, 1981). Detailed look at the Ming Imperial court. Levathes, Louise, When China Ruled The Seas (Simon & Schuster, 1994). A superb history of Cheng Ho's expeditions and the China that spawned them. Temple, Robert, The Genius of China (Touchstone, 1989). A bare summary of Joseph Needham's magisterial Science and Civilization in China, which is itself heartily recommended to anyone with a decade or so to kill. Friedman, David, The Machinery of Freedom (Open Door, 1989). Libertarian classic, including a quick guide to Icelander (and hence Vinlander) "government." Graham-Campbell, James, ed. Cultural Atlas of the Viking World (Facts on File, 1994). An attractive primer. Jones, Gwyn, A History of the Vikings (Oxford, 1984). Combines readability with reliability in a comprehensive package. Njal's Saga (Penguin, 1960). Probably the greatest of the Icelandic sagas, and another excellent source for the Icelander-Vinlander cultural and governmental ethos. Roberts, John Maddox, King of the Wood (Doubleday, 1983). The book so nice we used it twice, for Ezcalli and Midgard. Viking-rich alternate America, now with Mongols! Toynbee, Arnold, "The Forfeited Birthright of the Abortive Scandinavian Civilization." An AH appendix to volume two of his A Study of History, and the immediate catalyst for Midgard. The Vinland Sagas (Penguin, 1965). History before it became alternate. Hodgson, Marshall, The Venture of Islam, 3 vols. (University of Chicago Press, 1974). Not for beginners: an idiosyncratic but insightful look at Islamic culture through the ages. Huff, Toby E., The Rise of Early Modern Science: Islam, China, and the West (Cambridge University Press, 1993). A unique comparative study. Lapidus, Ira, A History of Islamic Societies (Cambridge University Press, 1988). The best one-volume introduction. Lewis, Bernard, The Muslim Discovery of Europe (Norton,1982). Gives the Islamic view of the world before the modern era. Sterling, Bruce, "The Compassionate, the Digital." An odd story of Muslim AIs (not AH). Turtledove, Harry, "Islands in the Sea." This AH story gives an excellent sense of Islamic manifest destiny. Aiken, Joan, The Wolves of Willoughby Chase (Doubleday, 1963). First of an utterly charming children's series of AH adventure novels with a rather different Stuart victory from ours. Heiman, Grover, Jet Pioneers (Duell, Sloane, and Pearce, 1963). Early jets, including Henri Coanda's. Howard, Robert E., Solomon Kane (Bantam, 1978-1979). Wrong century, wrong timeline, right attitude for a Commonwealth Covenanter. Jones, J.R., The Revolution of 1688 in England (Norton, 1973). An overview and political narrative. Noggle, Anne, Dance With Death: Soviet Airwomen in WWII (Texas A&M University Press, 1994). Fascinating stories, including that of the real Marina Raskova. Garrett, Randall, "Lord Darcy" stories. Classic alternate-history mysteries set in the 20th-Century Anglo-French Empire. No resemblance to Centrum, but still not to be missed. Kilian, Crawford, The Empire of Time (Del Rey, 1978), The Fall of the Republic (Del Rey, 1987), Rogue Emperor (Del Rey, 1988). Kilian's Intertemporal Agency has a lot in common with Centrum's Interworld Service; the series is worth reading. Kurland, Michael, Perchance (Signet, 1988). The Overline is culturally about midway between Centrum and Homeline – either could look like it in a few centuries. Laumer, Keith, Worlds of the Imperium (Tor, 1986) A different aristocratic dimension-hopping empire, more Anglo-French than Centran, and its reaction to a post-apocalypse timeline. Encyclopedia Britannica, 13th ed. (Britannica 1926). Contains the complete 11th edition (1910) with four supplemental volumes and a general index.